newly creative: Summer of Colo(u)r ~ or not! So, here it is the first week of July and it is still raining and today I'm so cold I've put the central heating back on. And I already had a vest, a warm jumper and a cardigan on! Despite the cold, I blog hopped around all the UKS Sponsor blogs this morning and saw an amazing array of techniques and projects. And having thought I was behind with last week's Summer of Color (although I wasn't!) I have spent some time today (in between watching Murray win his tennis match and watching stage 3 of the Tour de France) working on the next colour of ice cream. Or maybe I watched the television in between parts of the page drying ~ that sounds better! 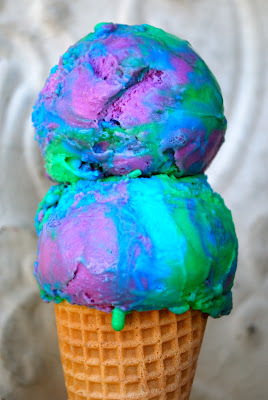 The next ice cream for Summer of Color is Wild 'N' Reckless. "A green apple, blue raspberry, and fruit punch flavored sherbet party. I'm not at all sure I would actually want to try eating this. The colours are fabulous for art but would I really want to eat them? using old colours of Dylusions ink sprays and Dylusions stamps. I love this. You do so much wonderful colour and texture work. What fun! Very imaginative - maybe its the rain that inspires? Beautiful piecce of art work. love it. Very creative. Fabulous, inky, wild'n reckless page...and a great quote too. This is fantastic - I love the mix of geometric pattern with the organic fungus - lovely composition and wonderful use of colour - stunning work. Love it! The textures are cool! Wonderful! Love how you used the colors and the stamping. That's absolutely cool...love the quote ! STUNNING work, Bernice!. I love the colors, the texture and the quotes! Hugs. I love your page. The textures and the soft colors really look great. The quote is inspiring also.